new challenges! will you join me? I just updated the “cool people doing cool things” page for the next few months of challenge to live an integrated life of focusing on spiritual, mental and physical growth. I’m pretty excited about these, so check them out! As always, you don’t really need to do much prep work, just let me know if you want to participate & comment on the blog about how you’ve been impacted. I will say that this book will be especially helpful for people who feel stuck in their current job, aren’t sure if they’re cut out for what they’re currently doing, have lost the passion for a job they once loved or are simply trying to live well in every area of life but are stuck somewhere. Even if you’re simply interested in learning more about yourself to become more self-aware, this will be a helpful book. I’ll post a discussion question every Sunday in February and share my own insights from the book. There is even a Strong-Life Test you can take online, but I would suggest not taking it until you read a bit in the book. That way you can maximize what you learn about yourself and apply it to your current situation. So, who will join me in finding and living your strongest life? 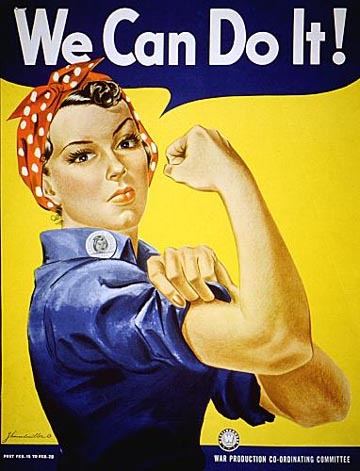 I don't think I'm cut out to be a riveter, but more power to Rosie! ← losing weight is easy- maintaining a healthy weight is hard!